So, back in June, I posted a preview of this Edwardian Poppet dress from 1908. Today, I am posting it finished. So, you can print and dress up the Poppets in it. My source was this Macy’s 1908 catalog. You can find the dress on page 97. It’s described as being made from chambray and trimmed in white. It came in rose or blue and cost 97 cents in sizes 4 to 14. 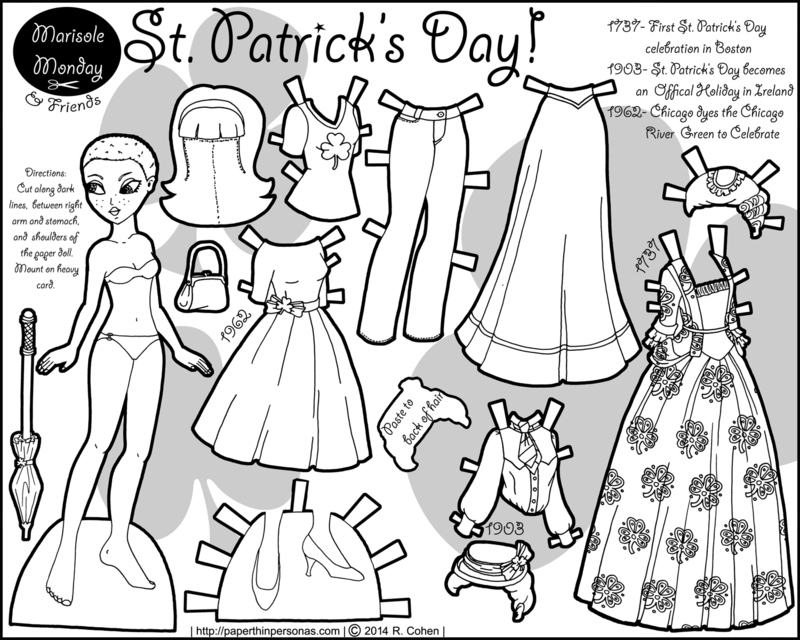 I imagine the Poppet paper dolls as about 10, so it is right in their age range. The Edwardian period is only one decade, 1900 to 1910 during the reign of King Edward. A lot of people extend the fashion period to 1914 since World War 1 really changed clothing. That makes sense, but then what do you call the era from 1914 until 1920? Anyway, I haven’t decided if I am willing to extend my era beyond 1910. I find Edwardian children’s clothing interesting, because it is so different from Victorian outfits. The popularity of Rousseau’s beliefs that children should be allowed to do play actively meant that the styles tend to be simpler. And unlike earlier periods, you can’t immediately ID the age of a child by the length of the skirt. Most skirts are just below knee length, no matter what the age. Though simpler than Victorian outfits, Edwardian children’s clothing still feels stuffy compared to today. 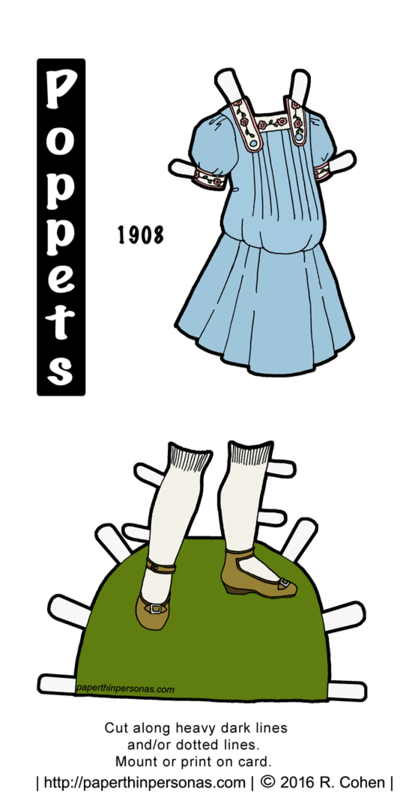 Several more Edwardian paper doll pieces planned, so eventually the Poppets will have a whole wardrobe of Edwardian outfits for all sorts of occasions. Until then, enjoy today’s summery 1908 dress even if it is December and outside it might not be so warm. So, Edwardian children’s clothes? Love them? Hate them? Personally, I have mixed feelings. I think it is the pigeon breasted thing. Other’s thoughts? Somehow, it just seems fitting to wrap the week with a ballgown. I mean, everyone needs at least one ballgown. I struggled with finding an Edwardian era ballgown that I liked. Most of the ones I saw were just too lacy for my taste. Eventually, I came across one from the book Victorian and Edwardian Fashions from “La Mode Illustrée” published by Dover. As much as I love the internet, I do really like having a few good costume plate books around for reference, because they often give contextual information which is helpful. This particular ballgown was recommended for young matrons, which I assume means ladies who were just married. I’ll confess right now that I don’t always get Victorian categorizations of age and/or class. What I do know is that ballgowns were, short of court dress, the most formal gowns a woman would ever own. In fact, many women would wear their wedding gown after their wedding as a ballgown for the coming year. Can I just say that it makes WAY more sense to me to buy a gown you’re then going to wear to balls than to pay like 5,000 dollars for a dress you wear once? 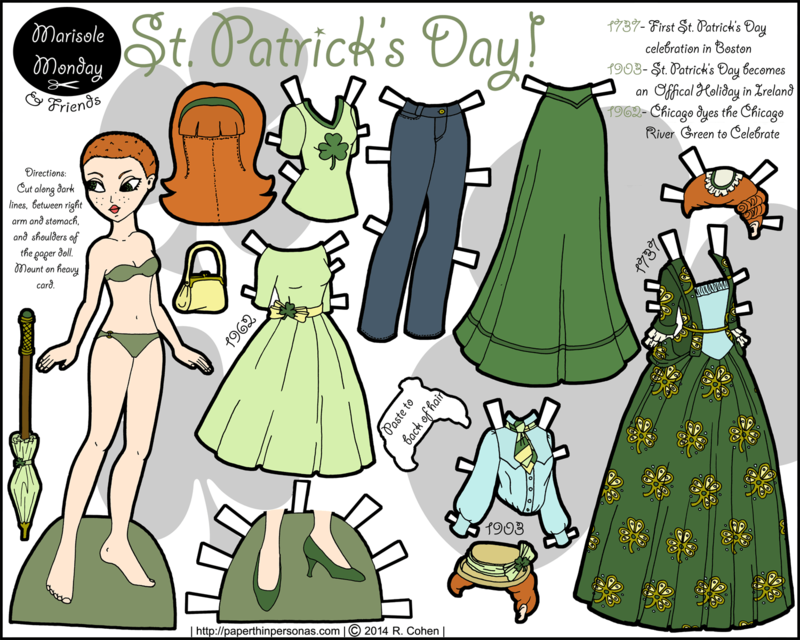 Anyhow, back to paper dolls… Here’s the whole of this week’s set if you missed any of the pieces. Note: I was a little surprised that “Mini-Maiden Little Red Riding Hood option” won by such a landslide, so I checked the voting logs. Seventeen votes came from the same IP address within the same time frame for that choice. Clearly, someone too the “vote early, vote often” mandate to heart, but since I noticed it, I have removed those votes from the system. Anyway, that’s all by way of saying, I might have gotten a little carried away on this one. I have a lot of sources to site for this eclectic collection of pieces. The shoes in this accessory set come from two different sources. The white pair of shoes comes from Philadelphia Art Museum. The boots are from this advertisement from The NYPL Digital Library. Both pairs are from 1908, sticking them right at the end of the era I’m interested in. The purses come from this particular page from the 1902-1903 catalog of the Chas. A. Stevens & Bros out of Chicago. Her parasol was based on this one, sort of. I think the resemblance is a little spotty. The hats come from a range of sources. The lavender and blue roses trimmed hat comes from this image from the NYPL Digital Gallery. Her furs and another hat come from this page from National Cloak & Suit Co‘s 1907 catalog. The truth is that hats of this era were very flamboyant. That makes them fun and challenging to draw. If you like the blog, than consider supporting it on Patreon. None of this happens for free and every little bit helps keep things rolling along here. 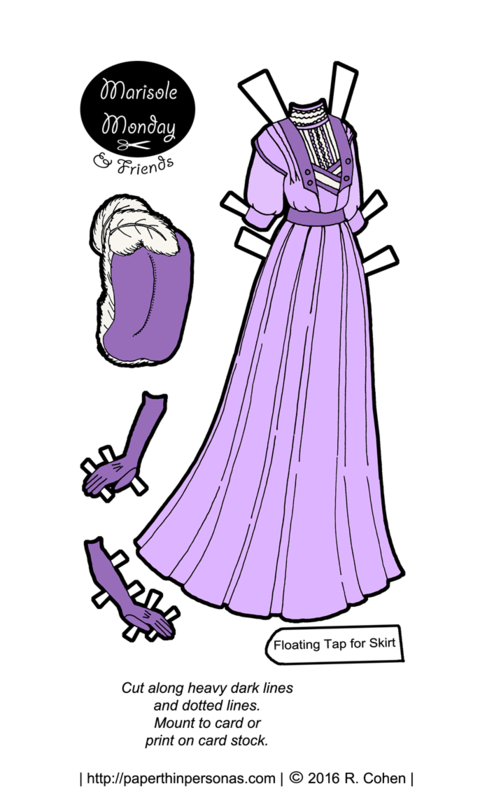 Lastly, just because I’m super curious, what are your favorite paper doll accessories? Hats? Shoes? Books? Swords? What makes your experience more fun? Also, I swear I did nothing but scan last night, so I am trying to decide what to work on this weekend. There’s a poll! 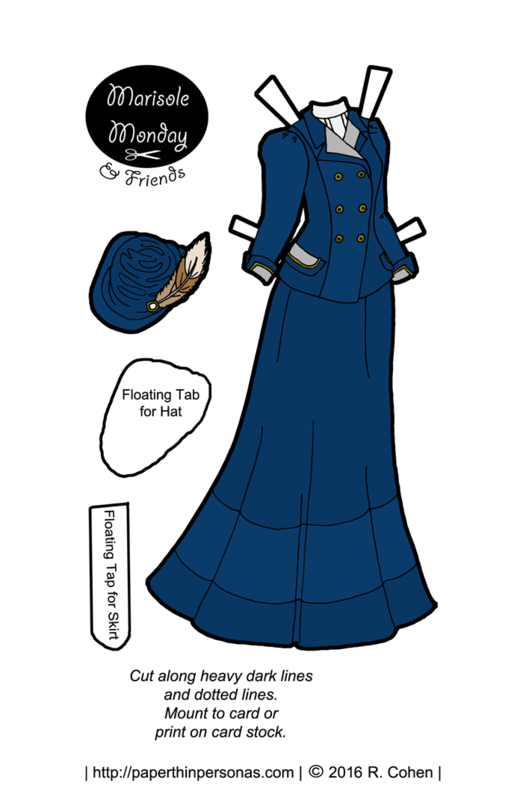 Today’s installment for Mia’s Edwardian Wardrobe is a walking suit. I figure every paper doll needs a good suit, just like every person needs one good suit. Suits were very much in fashion for ladies at the turn of the 20th century. This one is a navy blue wool and trimmed in gold braid and grey velveteen. Here’s the 1908 suit that today’s paper doll outfit is based on a page from this 1908 Macy’s catalog. Suits could be ordered in a variety of styles and in a variety of fabrics. The fabric selection dictated the cost of the suit- a more expensive tweed made for a more expensive suit than simple wool. I’ll confess this is not a literal re-drawing of the source material. I ended up simplifying the suit a fair bit and I sorta designed my own hat based on some others from the era. Hats in this period got to be a bit much sometimes. In case, you’ve never made a hat like this, here are some instructions I wrote up a while ago. 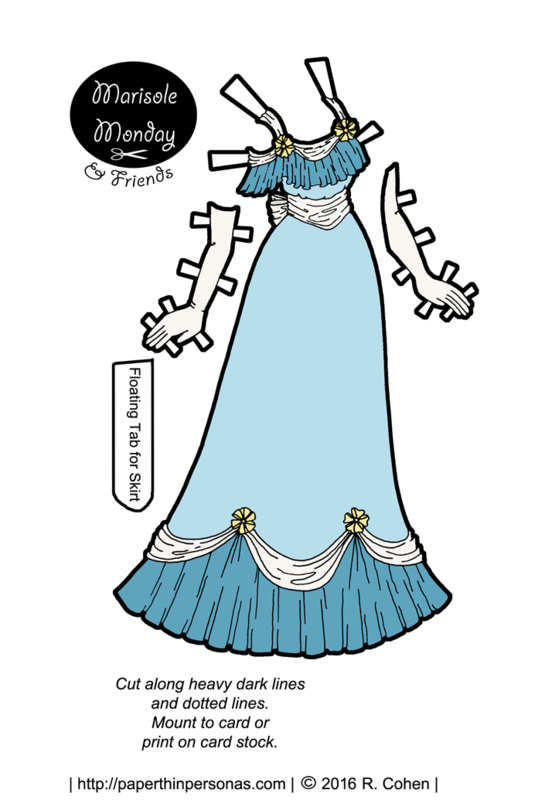 If you missed the doll to go along with this paper wardrobe, here she is from Monday. 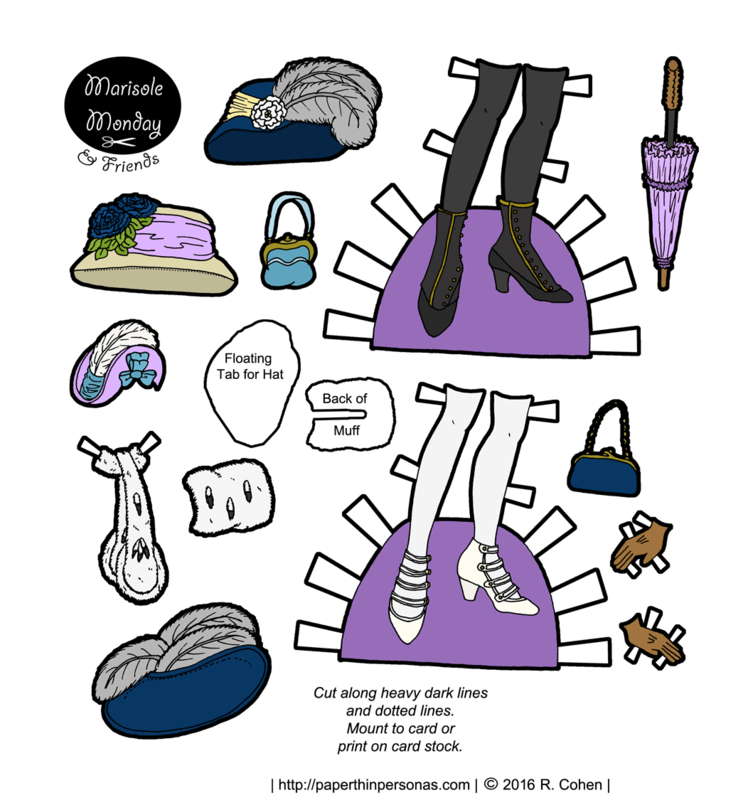 Also, as a friendly reminder, I have printing instructions here and you can find the black and white versions of the paper doll for coloring at the top of the post. There, I think that’s all the housekeeping for the day. Happy St. Patrick’s Day! A Paper Doll! Today, Margot is celebrating St. Patrick’s Day! Normally I when I do a color and a black and white version together, they are both pretty small. I decided to try out a different formatting option this time. First we have the full color version and then, a little further below, the black and white version. I decided it would be fun to do some historical St. Patrick’s Day costumes, so Margot has an early 18th- Century mantua gown on the far right covered in clovers. The mantua was in style until about the 1740s when it got replaced by other styles, but it was very much popular in the early part of the century. The first USA celebration of St. Patrick’s Day occured in Boston in 1737, so a mantua made sense. Next, she to that she has a 1903 blouse with skirt to commemorate the fact that in 1903, Saint Patrick’s Day became an official holiday in Ireland. The blouse should be worn over the skirt to get the pigeon breasted look which was so popular in the early 20th century. Margot’s hair is covered in a hat and she has a matching parasol. So, in 1962, the city of Chicago, known for it’s Irish population, dyed the Chicago River green for the first time using 100 lbs of vegetable dye. They continue that tradition today, though its only green for a few hours. I’ve never seen the river dyed, even when I was living in Illinois, but I’ve always wanted too. Margot has a 1960’s dress with high heels and a stylish flipped hair style.